Nigeria is a land of business opportunities,in this post we shall take a look at how you can start up quail farming in Nigeria and make profit. As usual we are going to quickly list all the important facts about quail farming in Nigeria on a commercial level. There are a lot of Agri business that you can invest in Nigeria,some are already popular while the rest are still not as popular. There are a limited number of people investing in Quail business,making it ideal for anyone to invest and make money,if you are interested in starting quail business in Nigeria,these are some of facts that you should know. 1. Quail farming was was introduced to Nigeria on December 16, 1992 through the Directorate of Food Road and Rural Infrastructure (DFRRI) of the Ministry of Agriculture,Abuja. 2. Quail farming can be traced back to Japan about 1200 BC,it was believed that it was used as drugs. 3. Quail bird farming is very lucrative,the market is not populated and it has different health benefits. 4. Quail is also believed to be medicinal. 5. Quails are small game birds of the pheasant order,the birds are stout birds with sturdy legs and curved bills. Their feathers are usually brown, speckled with white,black, tan, grey or chestnut. The bird averages eight to 11 inches in length. 6. Quail farming has a high return on investment within a short period of time as long as you follow the right process. 7. Quail birds are reared for their flesh and eggs, but the profit comes from the eggs produced. 8. Quail eggs are very nutritious. 9. In other to produce fertile quail eggs in your farm,you should mix your quails in a male to female ratio of one male to 5 females. 10. Quail farming is not labour intensive and cheaper to start when compared to chicken farming. 11. A mature Quail bird consumes about 20 to 25grams of food per day with little or no drugs while a chicken consumes an average of 150grams of food daily with a steady intake of regular drugs. 12. The price of Quail egg is almost the same as chicken. 13. Quail birds take about five to six weeks to mature while it takes about twenty to twenty four weeks for chickens. 14. The start-up capital of N150 - N200k is required to start a quail business in Nigeria,and if you have a good marketing strategy you can earn over N100k monthly. 15. To start up a Quail farm you will need to buy matured female and male quails,provide housing for the quails,buy feeders/drinkers,feeds and other miscellaneous expenses. 16. Female Quails lay eggs on a daily basis. 17. It is better to ensure that your quail cage or room is secured from thieves and reptiles,also the bird cage or room should be well ventilated. 18. Endeavor to clean the quail cage regularly in other to increase egg production and decrease the level of disease outbreak. 19. Give your quails clean water regularly,quails drink much water. 20. Always feed your quails promptly with quality feeds. 21. 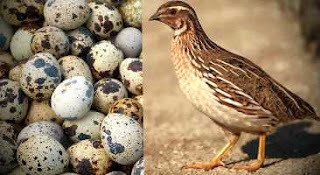 The demand for quail eggs is high,all you have to do is to look for people who are in constant demand for quail eggs. 22. Every business needs advertisement,so it's imperative that you adopt an effective marketing strategy for your quail business. You can run adverts or start off by telling your friends, colleague's,church members,neighbors etc the health benefits of daily quail consumption. 23. Currently a crate of quail eggs costs more than N1000. 24. You can sell your 2 - 4 weeks old chicks of quail birds for other start up farms or individuals. 25. For new people that want to start quail farming,endeavor to buy "about to lay quail birds" that will start laying eggs after 2 weeks. 26. Creating an online presence on social media will also help to advertise your quail business and attract more customers. 27. Lean meat gotten from quail is preferred by the elderly and hypertensive people. 28. Quail farming is one of the Agri - businesses that doesn't require intensive care. 29. Quail farming can be set up as a side business. 30. Anyone can start up quail farming in Nigeria.